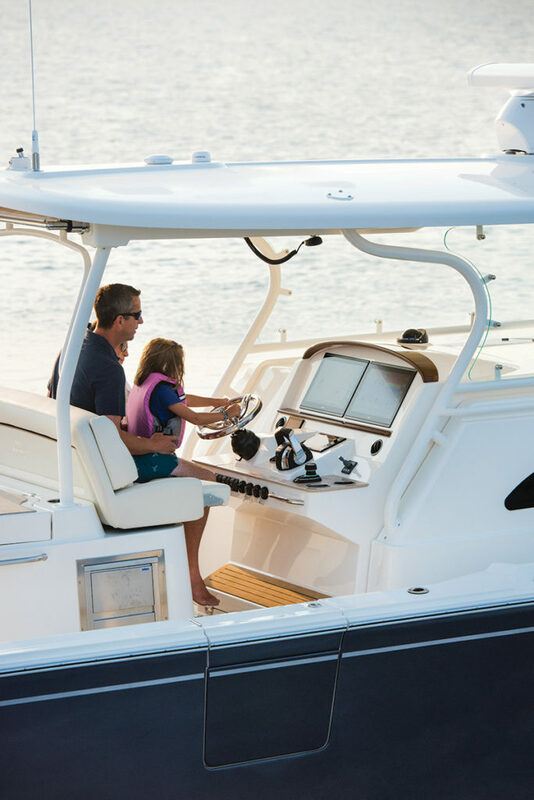 This outboard-powered center console is a sophisticated toy that a lot of boaters will want to play with. 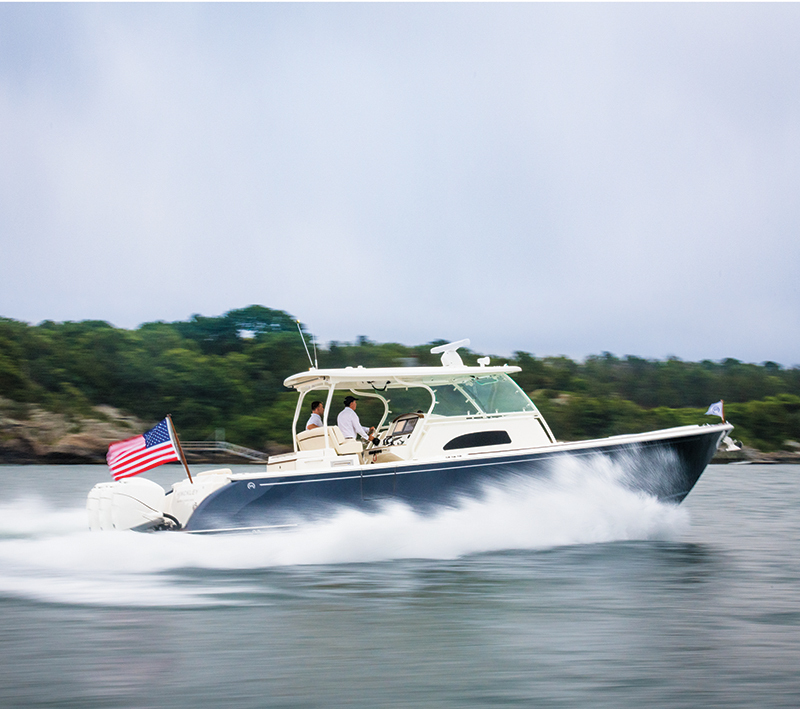 Three 400 HP racing engines from Mercury rumbled admirably as six of us made our way out for a test run aboard the new Hinckley Sport Boat 40C. Like many outboard-powered boats, especially those with 1,200 hp, the 40C doesn’t really like to go slow, so I asked everyone to hang on as I prepped to do some maneuvering. I slowed down to around 30 knots before carefully taking a turn into the short chop. The boat carved the turn without the least hesitation, so I turned back the other way and this time a bit harder. The 40C carved the reciprocal turn with equal ease. It was about this time that Jay Stockman, Hunt’s vice president, looked at me from the other side of the large helm bench we were sitting on and said, “That’s all you got? Go full throttle. She can take it.” I looked at him dubiously, again warned everybody to hold on and cranked it all the way up beyond 40 knots. We were flying along, and I was a bit reluctant, but Stockman, a guy I’ve known for a long time, kept nodding in the affirmative and calling me out with a mischievous look in his eyes. 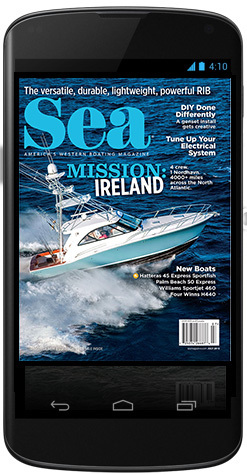 At about 45 knots — the boat reached a top speed of 46 knots with the optional Mercury 400Rs, where it felt solid and comfortable — I turned steeply to starboard and the boat dug in and carved a nice clean loop, gently cutting through its own wake. I spun the wheel hard over to port this time, pulled it as tightly as I could, and the boat evenly, gracefully and swiftly carved a reciprocal turn and formed a nice figureeight with its wake. There was not a bit of side slip or cavitation as we spun tight donuts at better than 40 knots. This was fun! I whirled around repeatedly, and no matter how fast the boat was going or how hard I turned, the Hinckley Sport Boat 40C easily spun and cut and never budged. It performed like a ski boat despite its length of more than 40 feet and weight of 19,000 pounds. At 25 knots the triple Mercury 400R outboards were burning a combined 32 gph, or 1.3 gpm, yielding a range of 312 miles. Thirtyone knots bumped the burn to 54 gph, but that is just 1.44 gpm, for a 282-mile range with a 10 percent reserve. These are respectable test numbers. 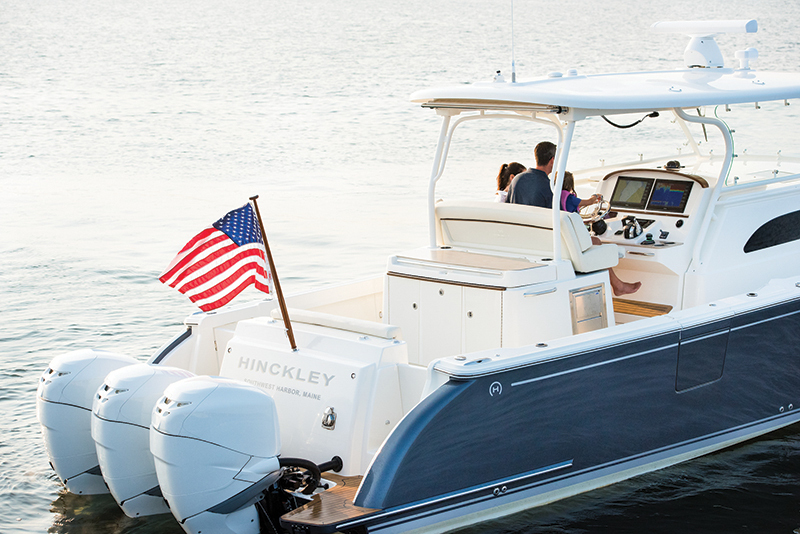 Hinckley is a boat builder known for its soft and flowing sheer lines, velvety smooth varnish, deep blue hulls and classic good looks. It has been building boats since 1928, and yet an old company does not necessarily mean old technology. Its brand is dedicated not just to aesthetics but to performance and innovation. Hinckley introduced Jet Drives in its Picnic Boats and is one of the first builders to offer joysticks. When designing its new outboard boats, company designers didn’t simply reinforce a swim platform so they could bolt engines onto an existing hull; they started from scratch. They built a modern, efficient boat that has the quality construction and finish Hinckley is known for, but with the speed and agility outboard motors are capable of. Company management knew these outboard-powered boats would be different, so they designated a new category: Hinckley Sport Boats. 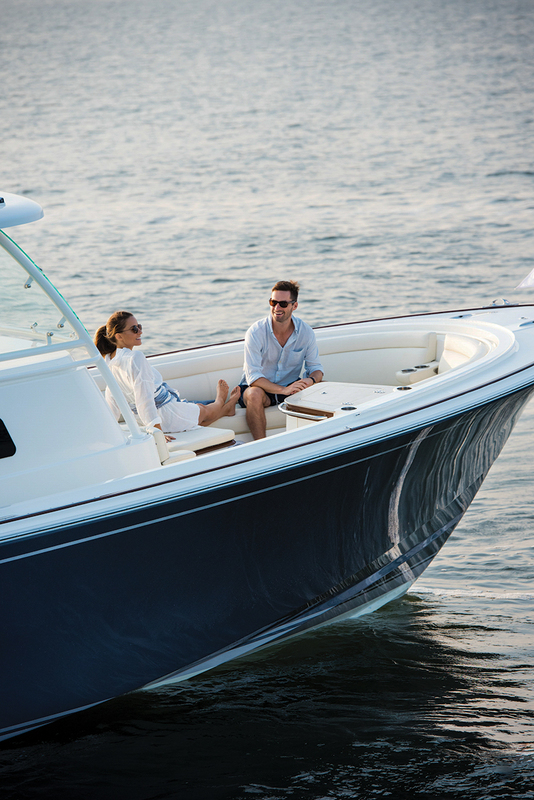 The Hinckley Sport Boat 40C is the first in this series and stands out in many ways. Hinckley Sport Boats are designed to be light and fast but with the strength and seakeeping ability to allow them to travel offshore safely and comfortably. The Sport Boat 40C utilizes vacuum infusion but takes it a step further by incorporating epoxy resins and modern high-tech materials. The vessel is cored with closed-cell foam and the hull is fully infused carbon epoxy with Kevlar reinforcement on the striking surfaces. The stringer grid inside the hull is bagged and singular bonded to the hull to create a monocoque structure. The entire hull is then post-cured in a state-of-the-art 80-foot-long digital oven. Not only does this process create a hull that is strong yet light, but it reduces or eliminates styrene emissions, so it is better for the workers and the environment. 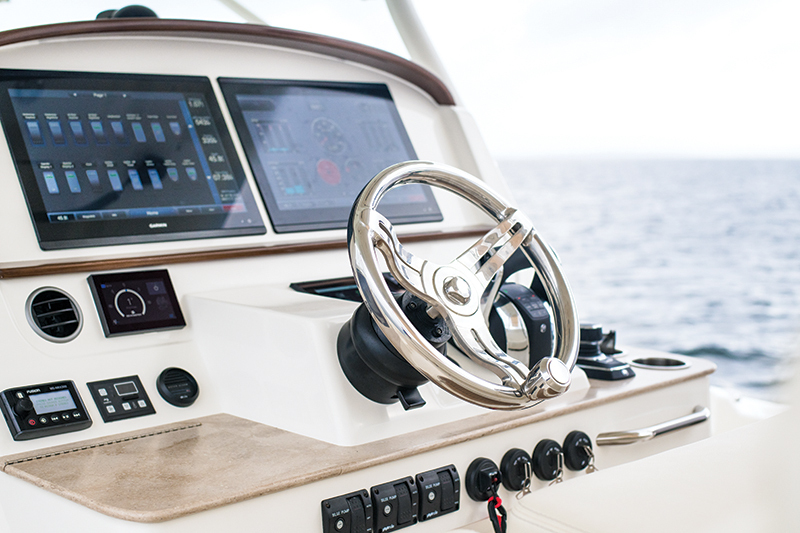 The C in 40C stands for center console, which the boat is, though the portside deck is raised to help in certain docking situations and to improve headroom below. The single entrance to the bow — the only forward walkup is to starboard — expands its seating area. Below is a substantial cabin that features a queensize bed and a galley with a refrigerator, an electric burner and a microwave. A head with a separate shower compartment shares the space. There is ample room for a couple to relax for an evening or take a weekend getaway. On deck is room for guests and enough drink holders and handholds to keep people secure — perhaps while their test captain runs the boat in circles at high speed. A few of our group of six sat up front in the U-shaped seating, where a removable table makes the area a dining spot. It’s safe and comfortable there, but it got a bit windy when we were really cranking along. Bolstered helm seating and footrests accommodate at least three people, either standing or sitting, in an area that has great all-around visibility. A centerline wheel and engine controls are within easy reach, as are the twin Garmin 7616xsv MFDs. Helm occupants are protected from the wind by a windshield and a hard top, but the breeze can come around the sides, and air conditioning vents are there for really hot days. 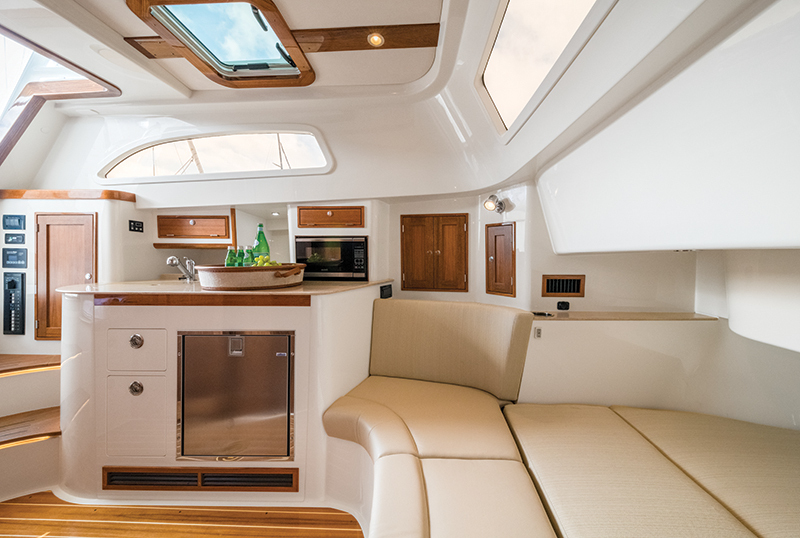 Aft of the helm is a console that can be configured in different ways, including with options such as an electric grill, a refrigerator, an ice-maker, a baitwell, a sink and trash bins. Foldout transom seating behind it can be covered by a retractable SureShade awning. 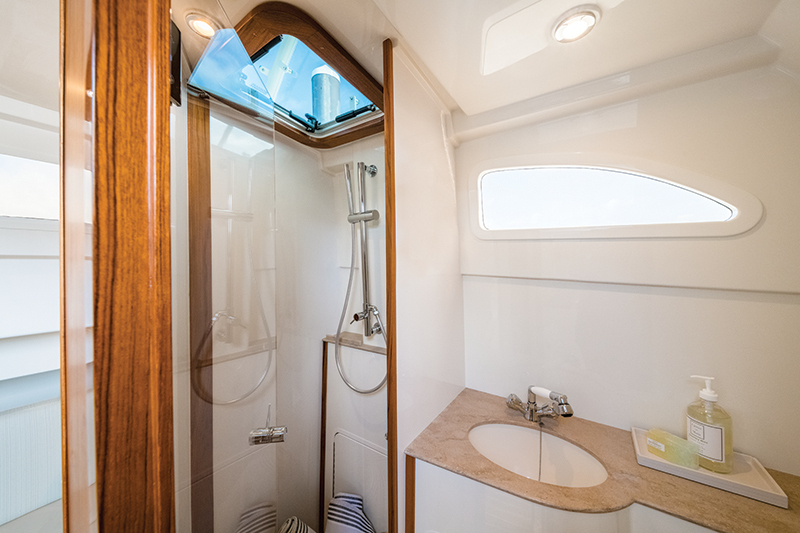 Big-boat systems such as C-Zone and a bow thruster are standard, as are artisanal teak accents that look like varnished wood but don’t require refinishing. A Seakeeper 3 gyro is an option that our test boat had. 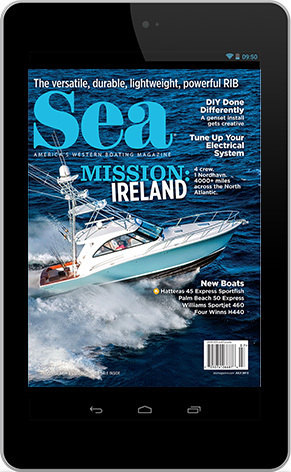 In 2013 Scout Partners LLC, the parent company of Hinckley, purchased Hunt Yachts, making Hunt and Hinckley sister companies and demonstrating that great things can happen when the talent and resources of two great brands come together. Hull form is one of these areas. Hunt Yachts founder C Raymond (Ray) Hunt was the innovator of the deep-V hull, and Hunt hulls are known for their performance and seakeeping. The Hinckley Sport Boat 40C hull, with a sharp entry, a deep V and a 23-degree deadrise at the stern, is a Ray Hunt design and performs accordingly. The hull and deck of the boat and other major pieces are constructed at the Hinckley yard in Southwest Harbor, Maine, and are then shipped to Portsmouth, R.I., for final assembly, commissioning and delivery, and it was at the Hunt facility in Portsmouth where I was able to test drive the Sport Boat 40C. As we idled into the marina, Stockman pointed out the optional Mercury JPO (Joystick Piloting for Outboards.) With the turn of a knob, the captain can make the boat spin and back up. We engaged the skyhook as we set our fenders and secured our docklines, and then we used JPO to slide the boat sideways to the dock. I have driven countless boats but this boat beckons because it is so much fun to drive. Whether out for a day-cruise romp in the waves or a weekend jaunt to the islands, the Hinckley Sport Boat 40C is the kind of sophisticated toy that a lot of boaters will want to play with. LOA: 42 ft., 7 in. Beam: 12 ft., 5 in. Draft: 3 ft., 1 in. Triple 300 hp outboards, integrated and retractable sun shade aft, refrigerator, cappuccino machine, microwave, cooktop, air conditioning, bow thruster, transom and bow settees, and more. 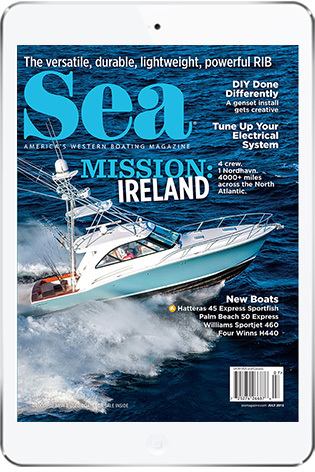 Triple Mercury Racing 400 hp outboards, Joystick Piloting for Outboards, Seakeeper 3 gyro stabilizer, ice-maker and electric grill in leaning post and much more. This entry was posted in New Boats, Boat Tests New by Stephanie Shibata. Bookmark the permalink.